Taking Gandhi's statements about civil disobedience to heart, in February 1922 residents from the villages around the north Indian market town of Chauri Chaura attacked the local police station, burned it to the ground and murdered twenty-three constables. Appalled that his teachings were turned to violent ends, Gandhi called off his Noncooperation Movement and fasted to bring the people back to nonviolence. In the meantime, the British government denied that the riot reflected Indian resistance to its rule and tried the rioters as common criminals. These events have taken on great symbolic importance among Indians, both in the immediate region and nationally. Amin examines the event itself, but also, more significantly, he explores the ways it has been remembered, interpreted, and used as a metaphor for the Indian struggle for independence. The author, who was born fifteen miles from Chauri Chaura, brings to his study an empathetic knowledge of the region and a keen ear for the nuances of the culture and language of its people. In an ingenious negotiation between written and oral evidence, he combines brilliant archival work in the judicial records of the period with field interviews with local informants. In telling this intricate story of local memory and the making of official histories, Amin probes the silences and ambivalences that contribute to a nation's narrative. 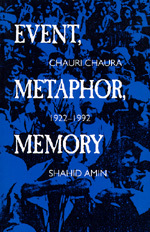 He extends his boundaries well beyond Chauri Chaura itself to explore the complex relationship between peasant politics and nationalist discourse and the interplay between memory and history. Shahid Amin is Professor of History at Delhi University. He has been a Visiting Fellow at Stanford, Princeton, and Berlin. He has authored Sugarcane and Sugar in Gorakhpur (1984), as well as several seminal essays in Subaltern Studies—of which project he is one of the founding editors.